Her blog is an awesome repertoire of every Konkani dish one can think of and the best part is - they are simple to make and yummy to taste! No wonder.. I landed on her blog and finally decided on making 'Batate Song' a simple Konkani recipe. 1. Cut the peeled potatoes into chunks. Mix chilli powder with the tamarind paste, add couple of teaspoons of water to it if needed. 2. Heat oil in a pan and saute onions for 2-3 mins, until golden brown. 3. Add potato chunks and tamarind-chilli powder paste. Mix the contents well. Cook for 5-6 minutes on low heat to blend in all the flavors! 4. Serve with hot rice. Y.U.M.M.O. Herb Mania: Coriander: Last Date - October 15th 2008.
Who would say no to potatoes..Looks too tempting Siri.. Sounds simple & delicious the potato curry, nice entry Sri! wow! that look yum and delicious! u have a very nice blog yar! come and join in the chicken event going in my blog! tempting one..adding tamarind paste is different. Glad you liked song Siri. Its one favorite at my home. This rice and a simple dal, a complete heavenly meal. 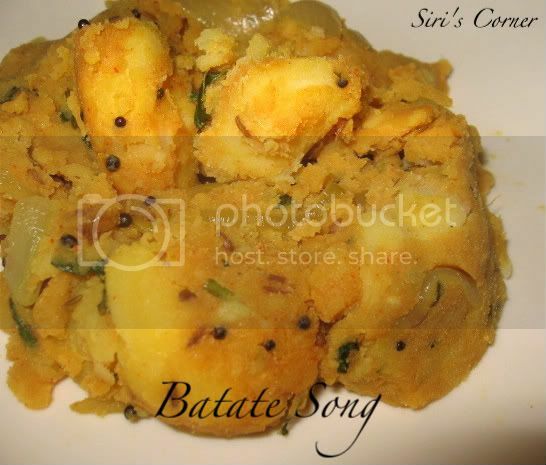 batata song looks so delicious..
oooh, batata song chala chala baagundi Siri! Picture chala tempting gaa vundi.